Returns the Last status (see SetLast). Returns the Actor defined as Next, or a Null Handle. Returns a Binder for No Result, i.e. a Null Handle. Prerequesite for Transfer : the method Transfer is called on a starting object only if Recognize has returned True on it This allows to define a list of Actors, each one processing a definite kind of data TransferProcess calls Recognize on each one before calling Transfer. But even if Recognize has returned True, Transfer can reject by returning a Null Binder (afterwards rejection), the next actor is then invoked. 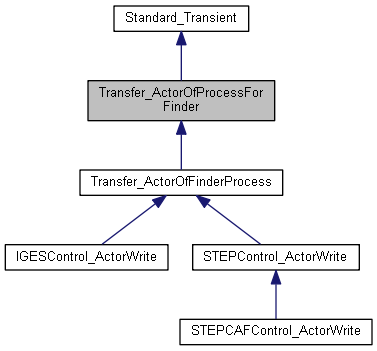 Reimplemented in STEPControl_ActorWrite, and IGESControl_ActorWrite. Defines a Next Actor : it can then be asked to work if <me> produces no result for a given type of Object. If Next is already set and is not "Last", calls SetNext on it. If Next defined and "Last", the new actor is added before it in the list. Specific action of Transfer. The Result is stored in the returned Binder, or a Null Handle for "No result" (Default defined as doing nothing; should be deffered) "mutable" allows the Actor to record intermediate information, in addition to those of TransferProcess. Prepares and Returns a Binder for a Transient Result Returns a Null Handle if <res> is itself Null.